The Division of Norham and Islandshire stretches from Carham to Holy Island, covering a variety of small communities. Its history includes the famous Lindisfarne Christian heritage, while Flodden, some 15 miles to the East, was the site of the largest land battle between England and Scotland. The Union Bridge, or as it is locally known the Chain Bridge, which spans the Tweed between Horncliffe and Fishwick is a sign of much happier times! 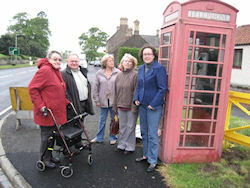 In Spring 2009 Anne-Marie held a series of public meetings in Norham to listen to people talk about their local priorities. Anne-Marie is currently working closely with West Ancroft Community Action to prevent the building of an ill-thought-through wind farm, and to encourage the Government to turn its attention to offshore renewable energy solutions. In 2009 Anne-Marie worked with a team of local volunteers to renovate the play area in Scremerston."